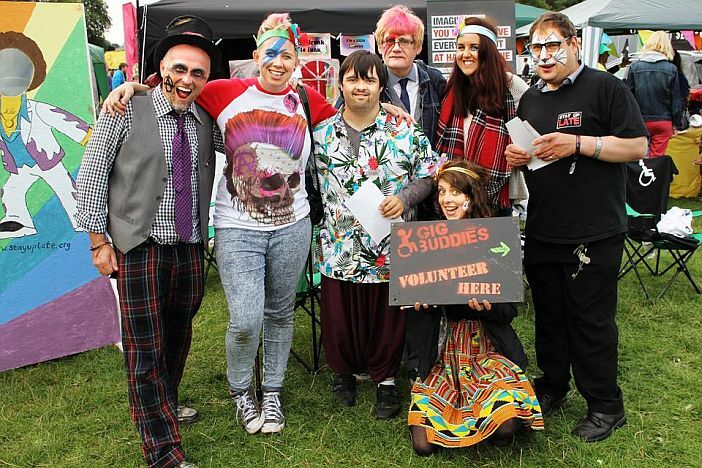 Gig Buddies is a local charity where volunteers are paired with people with learning disabilities who have similar musical tastes and interests. This allows people to stay out past their carers’ clocking off time. The original idea came about when legendary punk band Heavy Load noticed that their audience always seemed to diminish around 9pm. As a result the Stay Up Late charity was started and from that came the Gig Buddies scheme. We met Paul Richards, Heavy Load’s bass player and founder of Stay Up Late to find out more. I’d like to start by asking you about Heavy Load. You recently reformed to play a one-off gig, which ended up becoming a karaoke-style tribute to your vocalist Simon Barker who tragically died in August, with friends and fans singing a song each. Will there be any other Heavy Load shows or was that a nice way to call it a day? No, I think that was the final thing. It was a wonderful night, so much fun. All the support bands and everyone there added to it. We weren’t planning on reforming, it was always going to be one last gig. We’d planned on doing it then after Simon died we weren’t sure what to do. Jimmy and Michael wanted to go ahead with the gig but I felt that I wouldn’t know until after the funeral. It was Jerry (Rothwell), the film’s director that suggested making it a karaoke show. The one last thing we’re going to do is release a final single. We were meant to release it on the night but, a typically Heavy Load thing, we didn’t have the single ready in time, forgot to mention it and didn’t play the new songs. That will be the denouement, probably in January, a limited edition 7 inch. Will there be a launch party? We’ll do something that won’t involve the band but there will be an event of some sort. The last event went so much better than I’d expected that I’m not sure I’d want to repeat it. I don’t think there will be anything else but we haven’t talked about it. Who knows? How did Stay Up Late come about? I was working as a support worker and manager of Southdown Housing when I was playing with Heavy Load. As we were touring we were getting frustrated with our fans, quite literally being wheeled out before 9 o’clock. We were aware that our performances weren’t to everyone’s taste but it was clear that there must be a fundamental flaw in the care system. We started Stay Up Late as a campaign which was featured in the Heavy Load movie and it snowballed from there. Others said it was a massive issue for them too and the charity was formed in 2011 because we knew the band wasn’t going to go on forever, then we played our last gig in 2012. I thought we’d done a good job of raising awareness of how crap life can be if you live in this country and have a learning disability. How difficult was it to set up? 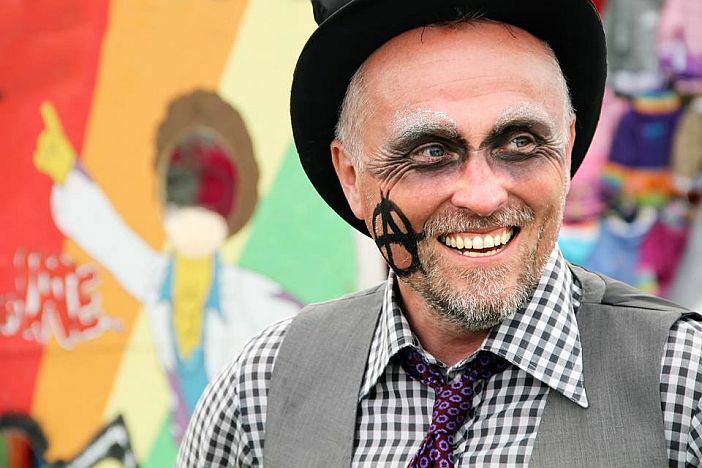 I found the arcane legal language on Charity Commission applications difficult and essentially it was five punks trying to set up a charity whose main purpose was to uphold a government policy that we didn’t see as working in practice. If you’re setting up a charity you have to have £5000 in the bank so it’s catch-22. How do you get that if you’re not a charity? So we raised this through fundraising. Were the council helpful with funding and premises? Not in the early days but we didn’t ask them. We got help from friends and Southdown Housing where I was working. When we started Gig Buddies we got council funding from the outset. The charity existed from my back room table for several years. What is your role within Stay Up Late and Gig Buddies? What are the best and worst elements of the job? I’m the Director of Stay Up Late, which is the charity, and Gig Buddies is our main project. The worst is the fundraising applications and evaluation reports. The best part is hearing the stories of people experiencing new things, seeing bands or doing things they’ve never done before and talking about their new friendships. The team are a great bunch of people who are fun to be around. Gig Buddies recently held an event that started at 9pm, rather than ending at 9, partying with English Disco Lovers until the sun came up. Is this something you’d like to do more of or are you more in favour of seeing people with learning disabilities attending ‘regular’ club nights? I’d seen an article on the BBC website that really irritated me about a rave in Manchester for people with learning disabilities that ran from 6pm to 9pm.The piece said that the reason was that people with learning disabilities don’t feel safe going to regular nightclubs plus their staff can’t support them late anyway. Everyone was saying what a great thing this was so I tweeted “Am I alone in my outrage that we live in a country where we’re happy that people should be segregated?” It’s like saying to Rosa Parks that we’re going to set up a separate bus service for people of colour and you can sit where you like then and then you’ll be happy”. It’s clearly a shocking thing to say around people’s race, so why are we saying it around people’s disability? I said to the team that I’d written an article for the website and emailed the BBC to say stop peddling this as good news when it’s clearly bad news. I told the team that I was thinking of starting a night at 9pm and they were up for it so I emailed Sam who runs English Disco Lovers to ask if he had any nights coming up and he said that they were thinking of doing a Gig Buddies fundraiser already. So we had a great night at The Komedia a couple of weeks ago and got home at 5am after breakfast in the all-night diner. During the night we had people coming up to us to say what a radical idea it was as they’d never seen people with learning disabilities or Down’s Syndrome in a nightclub before. With that in mind, is the next step to fully integrate into regular clubs? I think so. There’s been a big movement around ‘inclusive’ club nights for more than twenty years but I see this as a step on the way to inclusion. They offer great stuff such as learning to DJ and organise nights and people can meet their peers and they know it’s going to be safe but this isn’t going to change the world if we segregate people in this way. I can see why some people may see these events as a good thing but it’s not fully inclusive is it? Imagine if you treated other minority groups like this. If you said ‘No Blacks’ or ‘No Gays’ you’d be firebombed and shut down, and make front page news but for the BBC to say this is great, people are safe and segregated and that’s a good news story? It’s appalling when you start to unpick it. What I’ve always said about Gig Buddies is that it’s healthy for the individuals involved because they are being part of their community and being active and feeling included but it will make for healthier communities, I really believe that because it will slowly change people’s views about the roles of people with learning disabilities and not being seen as second-class citizens. That leads us on nicely to Nadine Dorries MP who you recently took to task over her use of the offensive phrase ‘window licker’ and her lack of immediate apology when informed of its meaning. It’s clear that there is still a long way to go in ending discrimination. On one level there’s just the complete failure of politicians to show any humility you know, so Boris Johnson doesn’t know how to apologise, Dorries doesn’t know how to apologise. Can you actually imagine what the country would be like if it was run by humble people? On another level there’s the fact that had she said something racist or anti-Semitic or homophobic she’d have been hung out to dry and quite rightly, but the population of people with learning disabilities really do seem like second-class citizens that aren’t seen as so important and find it so much harder for their voices to be heard. It was shocking. Her initial excuse was pathetic. I’d never heard the phase window licker used to refer to a Twitter troll and then in her actual newspaper apology she said she was referring to “those idiots who are at their computer screens all day”, using a word that she clearly has no idea of where it derives from. So it was actually an ironic apology. Some people don’t like that word being used because of the Idiot Laws which go back to learning disabilities. A horrible woman. Does it feel like you’re winning the battle in spite of instances like this? There’s been much more of a movement to challenge language and you get the right-wing anti-political correctness types. I’m more of the Orwellian view that “if thought corrupts language, language can also corrupt thought”, how the words we use really do shape the way we think about other people. There’s been some active work to challenge how we use these words but sadly the word retard seems to have become commonplace in America. How do venues support Gig Buddies? Have you met with any resistance or difficulties from anyone in supporting the scheme? Everyone’s been great. One Inch Badge and Sticky Mike’s Frog Bar support us with tickets and there was a sold out gig at the Concorde2 which they managed to find a couple of tickets for us. Bigger venues like the Brighton Centre run a ‘carers go free’ scheme anyway and the cinemas run similar schemes. We had one problem in Eastbourne where an employee asked a Gig Buddy why they should have a carer’s ticket as they didn’t have a visible disability, so we raised that with the venue and pointed out that most disabilities are invisible and that people shouldn’t have to go through the indignity of talking about their support needs when picking up tickets. Other cities have set up schemes: Sydney, Portsmouth, Edinburgh, Halifax and Croydon – where next? We’ll soon be setting up in Norwich and Long Eaton using the same model and hopefully in Wales next year. The idea is built on the core principles of friendship, proper community participation, culture and very much being led by people with learning disabilities but recognising that it will look different in every place. It’s really about having people in your life that aren’t paid to be there and being included in non-segregated mainstream culture. What the Buddies choose to do is entirely up to them and that’s the beauty of it. 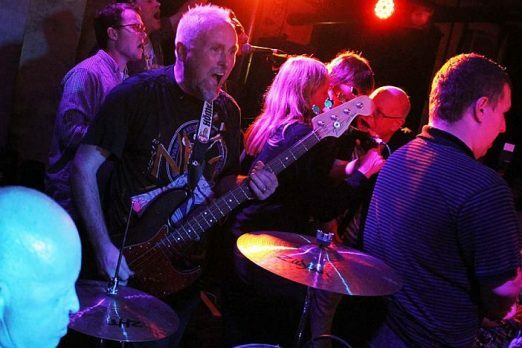 Can you ever see a way for people with learning disabilities to stay up late without the need for Gig Buddies? That’s my dream, that we shouldn’t have to exist as a charity. That in years to come we’ll have a society where people are just people and befriended. It was never in the plan to even start a charity and now the plan is to make ourselves redundant. Nationally, to get some movement in Wales and other parts of the country, possibly Sheffield. In Sussex, we’re hoping to increase the team to speed up the waiting lists. London is a goal. I reckon you could get twenty schemes running in London and not scratch the surface but we’re still working on that. It’s Gig Buddies’ 5th anniversary in March but I’m not sure what we’ll do for that yet. For our 3rd birthday we had a party at Sticky Mike’s and National Mencap came down to film us because they saw what we were doing as futuristic. We had Gaming Retro-Bution, pizzas, beer and dancing and Mencap saw this as futuristic. So, we’ll probably do something like that again. There are now nearly 100 Gig Buddies in Sussex. Are there any remaining from the very beginning? Yes, a few, including Jo and Christian who were recently featured in The Huffington Post. Gig Buddies was selected as one of the New Radicals in 2016. What did that involve? New Radicals is an award that NESTA gives to organisations or people that are seen as doing radical work in their community. When we won we were featured in The Guardian and Observer which resulted in lots of organisations wanting to copy us and people wanting to volunteer. Thanks Paul and best of luck for next year. Volunteers often come from a care work background but anyone wanting to share a passion with someone with a learning disability can become Gig Buddies – even SOURCE contributors. To find out more about Gig Buddies and details of how to join the scheme click here. There is a Gig Buddies fundraising event featuring Mik Artistik’s Ego Trip at The Komedia on Wednesday 6th December. Tickets are £10 available here. Gig Buddies will be joining The Rock House for their Xmas party at The Green Door Store on Saturday 19th December. Click here for details.